Each milliliter of Adequan contains 250 mg of Polysulfated Glycosaminoglycan and Water for Injection q.s. Sodium Hydroxide and/or Hydrochloric Acid added when necessary to adjust pH. Polysulfated Glycosaminoglycan is chemically similar to the mucopolysaccharides of cartilaginous tissue. It is a potent proteolytic enzyme inhibitor and diminishes or reverses the processes which result in the loss of cartilaginous mucopolysaccharides. PSGAG improves joint function by stimulating synovial membrane activity, reducing synovial protein levels and increasing synovial fluid viscosity in traumatized equine carpal joints. Toxicity studies were conducted in horses. Doses as high as 1,250 mg were administered intracarpally to 6 horses once a week for 18 weeks. This dosage is 5 times the recommended dosage and 3.6 times the recommended therapeutic regimen. Clinical observations revealed soreness and swelling in 1.8% (2 of 109 animals) at the injection site which was mild, self limiting and lasted less than one day. There was a dose related evaluation on partial thromboplastin time, creatinine and glucose. No animal had any clinical illness during the trial and none showed clinical evidence of toxicity except transient swelling at the injection site, possibly due to mechanical invasion of the joint. Adequan is recommended for the treatment of non-infectious degenerative and/or traumatic joint dysfunction and associated lameness of the carpal joint in horses. Do not use in horses showing hypersensitivity to Polysulfated Glycosaminoglycan. Do not administer Adequan in the face of joint sepsis. Do not use in horses intended for human consumption. The recommended dose of Adequan in horses is 250 mg (1 vial) once a week for five weeks, intra-articularly. The joint area must be shaved, cleansed and sterilized as in a surgical procedure prior to injection. Do not mix Adequan with other drugs or solvents. Inflammatory joint reactions consisting of joint pain, effusion, and swelling with associated lameness. Less frequently, nonseptic arthritis, hemathrosis, and cellulitis at the injection site and surrounding tissues have been reported. 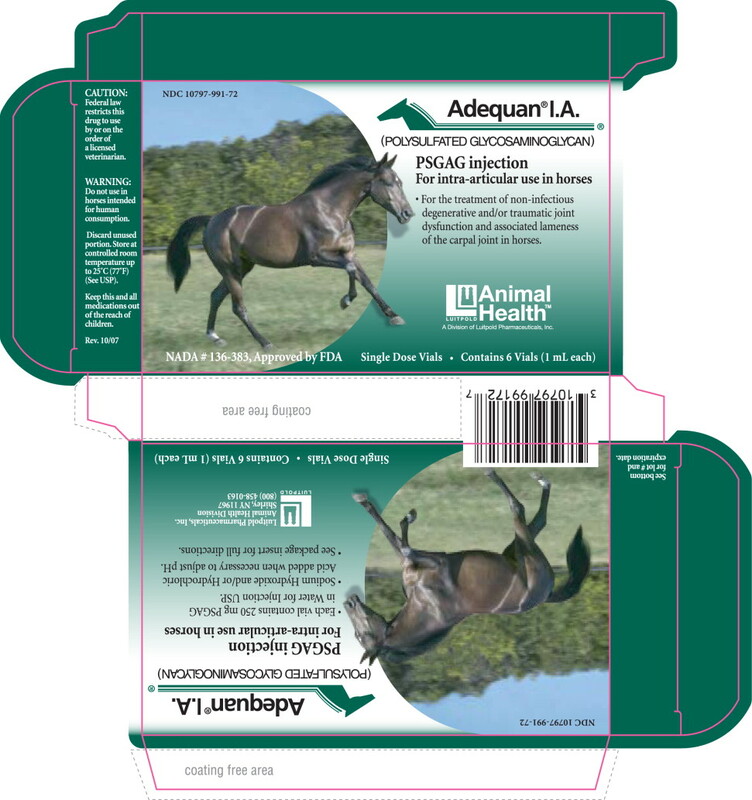 Adequan is indicated for use only in the carpal joint of horses. Do not mix Adequan with other drugs or solvents. Reaction in the joint may occasionally occur within 48 hours after intra-articular treatment. If the reaction involves excessive inflammation, cease therapy with Adequan. Post-injection inflammation may result from possible sensitivity to Adequan; traumatic injection technique; exceeding the recommended dose, frequency of administration or number of Adequan injections; and from combining Adequan with other drugs. Excessive joint inflammation may be manifested by rapid onset, tenderness, swelling and warmth over the injection carpus. Inflammatory joint reactions may successfully be treated by systemic anti-inflammatory drugs, cold hydrotherapy and rest. Serious reactions of this type may indicate the presence of joint sepsis. Joint sepsis is a rare but potentially life-threatening complication of the intra-articular injection. It usually results from the deposition of skin organisms into the joint space by the needle tip. Gustafson et al., (1989) have demonstrated that Adequan may potentiate a subinfective dose of contaminant bacteria. (2, 3). Hence, strict aseptic injection technique is of utmost importance. Successful resolution of joint sepsis depends on prompt recognition and rigorous antimicrobial treatment. (1, 4, 5, 6). Early diagnosis of septic arthritis may be complicated by the similar appearance of joint inflammation. Excessive inflammation accompanied by lameness, swelling, and edema extending beyond the joint limits should alert the practitioner to the possibility of sepsis. Synovial fluid analysis with cytology and bacterial culture of the fluid or a section of synovial membrane are valuable diagnostic aids. Upon suspicion of joint sepsis, broad spectrum antibiotic therapy should be instituted without delay and joint lavage considered. It is recommended that samples used for bacterial culture be taken prior to initiating antibiotic therapy. The concomitant use of Adequan with steroidal or non-steroidal anti-inflammatory agents may mask the symptoms of joint sepsis, thereby delaying the diagnosis and reducing the likelihood of a satisfactory resolution. Intra-articular injections should not be performed when the overlying skin is scurfed or blistered, as this precluded adherence to aseptic injection technique. Veterinarians are directed to the Reference Section below for additional information concerning septic arthritis and its treatment. Fertility impairment studies in mares and stallions have not been conducted. Do not use in horses intended for breeding. Store at controlled room temperature up to 25°C (77°F) (See USP). Bertone, A; Mcllwraith, CW et al: Comparison of various treatments for experimentally induced equine infectious arthritis. Am J. Vet Res. (48): 519, 1987. Gustafson, SB: Mcllwraith, CW: Jones, RL: Comparison of the effect of polysulfated glycosaminoglycan, corticosteroids and sodium hyaluronate in the potentiation of a subinfective dose of Staphylococcus aureus in the midcarpal joint of horses. Am J. Vet Res. (50): 2014-2017, 1989. Gustafson, SB: Mcllwraith, CW: Jones, RL: Dixon-White, HE: Further investigations into the potentiation of infection by intra-articular injection of polysulfated glycosaminoglycan and the effect of filtration and intra-articular injection of amikacin in horses. Am J. Vet Res. (50): 2018-2022, 1989. Koch, DB: Management of infectious arthritis in the horse. Comp. Cont. Educ. (1): 546, 1979. Mcllwraith, CW: Treatment of infectious arthritis. Vet. Clin. N. Am., Lg. Anim. Prat. (5): 363, 1983. Morris, PG: The clinical management of septic arthritis in the horse. Comp. Cont. Educ. (2): 5207, 1980. Von Essen, R. and Holtta, A: Improved method of isolating bacteria from joint fluids by the use of blood culture bottles. Ann. Rheum. Dis. (45): 454, 1986. For the treatment of non-infectious degenerative and/or traumatic joint dysfunction and associated lameness of the carpal joint in horses. A Division of Luitpold Pharmaceuticals, Inc.